Hey peeps! It's Saturday and that means another pair of cards made with the new The Alley Way Stamps:) Today I have a couple of colorful cards to share. They both have lots of yummy color, but are at opposite ends of the design spectrum. 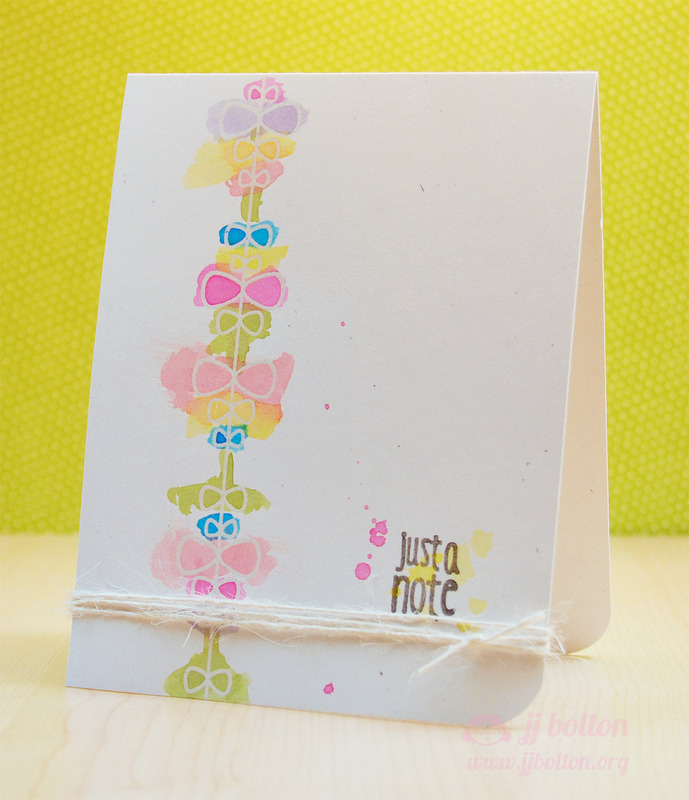 The first card was made with No Peeking and Petal Pushers. 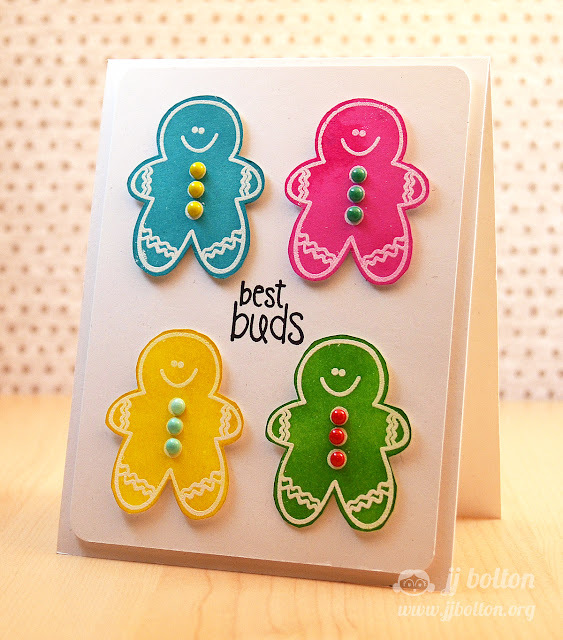 I heat embossed the gingerbread men with white embossing powder and then blended on different distress inks. Finished off each little man off with some enamel dots. So cute! My second card has a lot of color too, but a totally different feel! I heat embossed the vine stamp from Petal Pushers in clear. Then I used different colors of distress inks as watercolor paints. (Just put a bit of the color onto a craft sheet, add in a bit of water, and paint the color on with a small paint brush) This is not my usual style, so I was treading in new waters here! But in the end, I thought the result had a really sweet organic quality which is what I was hoping for! Thanks so much for checking in today! Don't forget to drop in to the The Alley Ways Stamps blog! They're always hosting all kinds of fun over there! Your gingerbread people are so adorable. Cute card. I like the way your distress ink watercolors turned out on your second card. I will have to brave that technique and try it out. Happy Holidays, JJ. The gingerbread men are so colorful and cheerful. Love the second card. I see more of your ink blending on the first card, JJ. Totally agree that this is superior over using colored paper (although I wouldn't have thought of that on my own) ... thanks so much for the advice! And although the second card isn't your typical style, it still looks like you ... love it! Merry Christmas!! Talk about trendy - neon gingerbread men - That's AWESOME!!! These are so pretty, kind of in love with that second one! Oh goodness JJ! Those gingies are amazing! Love their pretty colors and those buttons that remind me of candy! Aw, the gingies turned out perfect! Love the sentiment with them, and those enamel 'buttons' are super cute! And the second card? I wanna try that! I love using my inks as paint, and I love the mix of colours & splatters :) Awesome! LOVE the colorful gingerbread men! 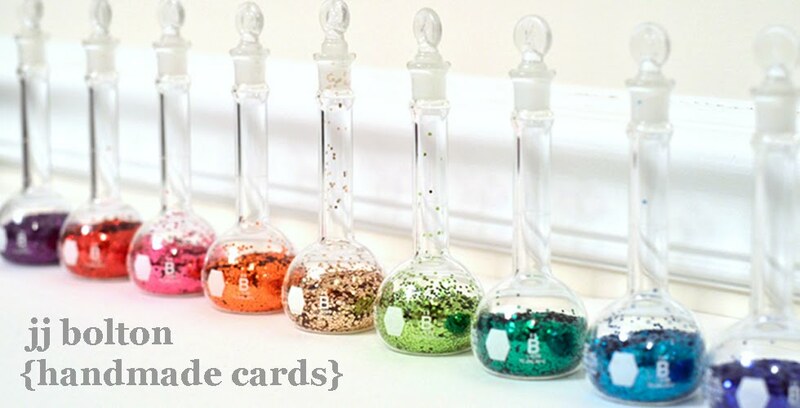 The enamel dots are the perfect embellies! And the second card is so cool--just love those splatters! Awesome cards JJ! The gingerbread one is so fun and different, but it's the second one with all the soft splatters that I really love! JJ your cards are stunning, I love that you created in neon. Something that scares me but shouldn't. I always love to see what you create, it makes me smile. A very happy new year to you! These are fabulous, JJ! Totally loving those bright and cheery gingerbread men and the soft colours on the second card are gorgeous! I love how you try a new technique and rock it immediately! LOL! Hope you all had a lovely Christmas and that 2013 rocks!